Samsung India E-Store, The Galaxy Note 2 - Pre-booking process has started. You can Pre-book your tablet for Rs 5,000 , but Samsung did not disclose the actual price of the tablet. With this Samsung is also giving free Desktop Dock tablet users the price of Rs 2,399. 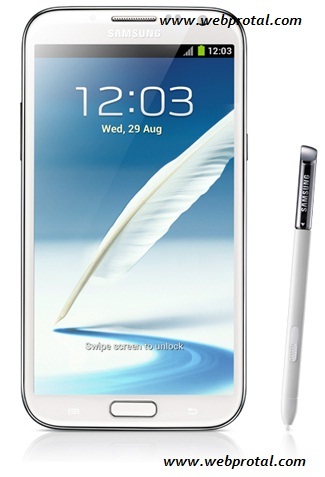 Note 2 is the successor to the successful Galaxy Note. It will have 5.5 inch display and will work on Android 4.1 HD Super Mold Jelly Bean . Inside it, it have quad-core Samsung Exynos with 4 Quad 4412 mobile processor, 2 GB RAM, and which is clocked at 1.6 GHz, and Mali-400 MP graphics chip. Tablet with auto focus and LED flash, 8-mega pixel camera on the back side.Galaxy Note facing 1.9 mega pixel camera for video calling 2.